If I were to create a magazine, it would be Mollie Makes. I might not have come up with that clever title, but all of the content is what I would have put in there. 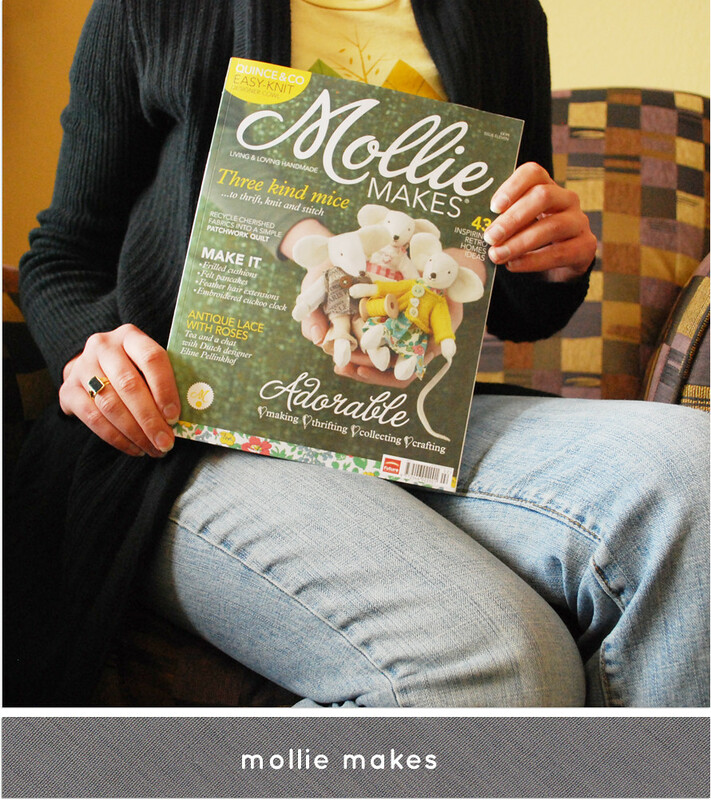 So it makes me happy that it's called Mollie Makes, that the masthead looks very similar to how I sign my name, and that this issue features one of my patterns. I'm utterly delighted at this last bit. See a few peeks from my feature here. STITCH SWAP NOTE: I'm looking for Helena from Australia. Your email bounced, so if you could email me, then I'll get you your swap info. Thanks! Oh. I am laughing (at myself). For a few months now I have seen that magazine in a few places I go...and each and every time I think, "I wonder if that is the gal from Wild Olive..." When I saw your post I had kind of a "duh" moment...If it WAS "her" I am pretty sure there would have been SOME promotion of the magazine here...LOL...Bottom line *I* certainly thought it could be, you have all of the talent for it. Congratulations, Mollie! Your cuckoo clock is so adorable! So happy for you- Have a great weekend! Congrats! I've seen some of the earlier issues and that magazine is gorgeous, great place to showcase your work! Looks like another cute project too, will keep a look out for that issue :) Been circling the swap project today and thinking Mollie-thoughts. P.S. I am in awe of the amount of work you are putting into this swap! You are truly an inspiration. I love this magazine. Can't wait to see the newest editon. Congratulations! I have been subscribing to this magazine through Zinio for a while because it was so hard to find, but I truly love it. And I love your little clock design too. Keep making, Mollie!!! Congratulations mollie! It is an adorable pattern. Thank you so much for organising the stitch swap, it must be taking a lot of your time, it is very much appriciated though. I had my email from you, but thought I would let you know that I found it in my SPAM box, in case others had forgot to check there!